Susan Maughan was born in the North East of England, grew up in Birmingham and lived for some time in London- but you are probably more likely to find her in the North West these days because of her frequent summer seasons at Blackpool. In 1962 she rapidly became seen as the main UK challenger to the chart dominance of the young Helen Shapiro. This followed the release of her wonderful record, 'Bobby's Girl' - an exceptionally well made cover version of a song released in the U.S. by Marcie Blane. Susan had begun her career, like Helen, as a young teenager- but she was twenty by the time of this great hit. Before Susan finally made the charts she had spent three years as a singer with Ronnie Hancock's Band and then a further year with the great Ray Ellington Quartet. Not only was she a good singer after all this musical experience but she was also an exceptionally pretty girl. This was no disadvantage as it made it easier for her to obtain singing parts in numerous movies including the British rock and roll film, 'What A Crazy World' starring alongside Joe Brown and Marty Wilde. 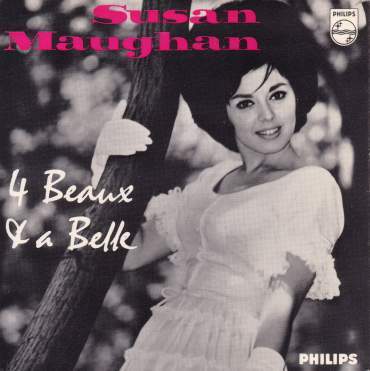 Although Philips released no less than four EPs of Susan Maughan's songs while she was at the peak of her recording career, none are now easy to find. This is unfortunate because they are a good way of obtaining songs that weren't issued as part of her repertoire of singles. Her third EP "The Effervescent Miss Maughan" appeared in the Philips catalogue for only a short period of time and is particularly difficult to winkle out. I've chosen to show the EP on the right (Philips BE 12549) simply because it carries such a very nice picture of the lady. Unfortunately, Susan Maughan's chart career was short lived as she was unable to consolidate her hit credentials with a substantial follow-up. She had the opportunity to cover the Exciters' 'Tell Him', but the number was foolishly rejected as 'unsuitable' by her manager and the benefit went to Billie Davis. Nevertheless, Susan Maughan remained a top live performer throughout the 1960s and 'Bobby's Girl' helped sustain a lengthy and eventful show business career over the next several decades. Philips BBE12525 1962 "Hi! I'm Susan And I Sing"
Philips BBE12549 1963 "Four Beaux And A Belle"
Philips 433.621BE 1963 "Effervescent Miss Maughan" w. Wally Stott Orch. Philips 433.641BE 1963 "More Of Maughan" w.Wally Stott Orch.